One of the really nice things I like about some of the older Microscale sheets is that they did these air wing sheets. It is nice to be able to have a choice of different aircraft on a sheet rather than have multiple markings for a single type. This particular air wing is now one of the two RAG's (Replacement Air Group), that are tasked with providing training to both air and ground personnel. In the East Coast, those units have an AD tail code. On the West Coast, those units are coded NJ. At one time both of these groups were destined for carrier duty, but in the 1960's they became the final training step before joining fleet units. This particular sheet has four aircraft from different eras. As with many Microscale sheets, this one is devoid of many of the markings needed. 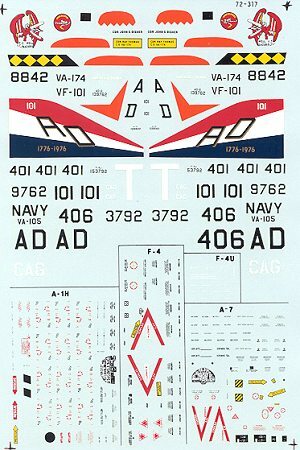 In this case, you will have to find a different source for national insignia as well as for the NAVY markings for the A-7 and F-4. Starting with the older of the four aircraft is an F4U-4. This aircraft is in overall sea blue with large, white bands on the wings just outboard of the hinge line. Next is an AD-6 Skyraider of VA-105. This plane has an orange chevron on the fuselage and has orange tail and wing tips. This orange is also on the tips of the underwing fuel tanks. The A-7E is from VA-174 and is marked in the standard light gull grey over white as is the Skyraider listed above. This 'Hellrazors' Corsair II has the air wing tail code moved to the rudder, an unusual place for aircraft of this era. Finally, a VF-101 F-4J. This one carries the usual red, white and blue tail stripes. In addition, this aircraft carries bicentennial marks with '1776 - 1976' painted in gold on the blue tail stripe. With the addition of the unit badge on the fuselage, it makes for a quite colorful aircraft. Though not shown in the sheet, I believe that the wing tips were also painted red. This isn't exactly a new sheet, as several of the recommended kits are now considered unsuitable or too old. For instance, they recommend the Fujimi F4U-4, which is badly out of scale. Unfortunately, no one does a decent -4. The best in terms of shape is the Matchbox kit, but it is a very simple model and needs a lot of work. For the AD-6 the Fujimi kit is recommended. While not a bad kit, the newer Hasegawa offering is probably a better choice. Rather than using the Airfix A-7E,the vastly superior Fujimi A-7E would be a better choice. Revell's really dated F-4B is not what you want to use for the Phantom, but instead the vastly superior Hasegawa or even the Fujimi F-4J would be a much better choice. All in all a very interesting sheet with lots of possibilities and color. Review item courtesy of your increasingly impoverished editor! If you would like your product reviewed fairly and quickly by a site that has over 1700 visits a day, please contact me or see other details in the Note to Contributors.